A layoff typically comes as a complete surprise. When it hits, you might even be in for a bit of a shock. There’s usually a combination of hurt, anger, fear, and anxiety. But once the initial shock wears off, you might want to try to apply a little bit of positive energy to the situation. No, a layoff is not a happy event. But while we can’t control what happens to us, we can certainly change the way we deal with it. At a time like this, it might be best to step back and do some reflecting. Are there any reasons why this layoff could possibly be a positive development? I can actually think of a few situations where it could be. Have you ever known or heard of someone who was laid off and actually felt relieved? I realize that might be a counterintuitive reaction, but having experienced a couple of job losses myself, I can report that it can actually be a very positive development. While it’s true that you probably need your job as a means of survival, there are plenty of employment situations that are something much less than a happy marriage. For example, you could have been working for a boss who demanded more than you could give. You might have had one or more coworkers who were making your life miserable. The company may have set goals and expectations that were not doable. You may have been passed over for promotion. Or you may have been stuck in a job that just didn’t fit your skills and preferences. The loss of that kind of job is often a mixed bag. Sure, you’re worried about losing the paycheck. But the other stuff – the things that made your life miserable on the job – you’re more than happy to say goodbye to. Sometimes we find ourselves working in a job that truly isn’t a good fit, but we feel too insecure to leave (that’s actually a negative mindset that can be nurtured by a bad job situation). We know that we should leave, but don’t take the initiative. But then circumstances develop that make the decision for us. That’s not always an unhappy outcome. If that is your situation, embrace it for all it’s worth. You’re getting out of a painful situation, and that will clear the path for you to seek a better one. As much as we may not want to admit this, sometimes a layoff is completely our own fault. Let me explain. Many times, people find themselves working in jobs and careers that don’t really work for them on any number of levels. They may have gotten into the field because of parental pressure, a lack of direction early in life, or even by accident. However they landed in the job, it’s never really been a good fit. As the years pass, they gradually, quietly burn out, until they are no longer effective in their work. That’s when – and why – a layoff hits. We can only pretend for so long, but eventually it becomes obvious. Your boss and your coworkers become painfully aware that you are not the right person for the job. It may not even be anything specific that you are doing or not doing – you simply might not be bringing the right energy and enthusiasm to the job. If you even suspect that this may have been a factor in the loss of your job, you should greet your layoff as an opportunity to make a career change. Yes, it’s scary to make a change as big as one that involves your occupation, but you will never arrive in a career that you are meant to be in if you don’t. Instead of agonizing over the events that led up to your job loss, do some soul-searching. Ask yourself if you even liked that job, and that field – and be completely honest in your answer. It could even provide some clues about your future direction. The layoff should always be viewed as a career break more than anything else. It gives you a chance to step back and reflect on where you’ve been, and whether or not your work is actually working for you. If it’s not, it may be time to fill your hours figuring out what you should do for your next career. Some people do very well working in an organization. They thrive with a set schedule, management oversight, a daily work agenda, and the support that working with others brings. Others however feel constrained in the same environment. If you felt this way for a while, you may be one of those people who is just cut out to be self-employed. If you have at least three or four of these traits, being self-employed might be in your blood. Be open to the possibility of becoming self-employed. Your layoff will be opening that door in your life. Remember back when you were in school, and you had that extended summer vacation every year – the one that lasted for two or three months? It was a welcome break between school years, wasn’t it? How many chances do you get to take that kind of break in adult life? A layoff may provide just that opportunity. It may not be good for your finances, but it can be exactly what you need on an emotional, spiritual, and even physical level. Sometimes you just get burned out – we all do. This is an opportunity to clear your head, to get some rest, to do some experimenting, and to prepare yourself for the next push forward in your life. By doing this, you can actually convert a layoff into a positive experience. You may even find that you come out of your layoff in better shape than you went in. 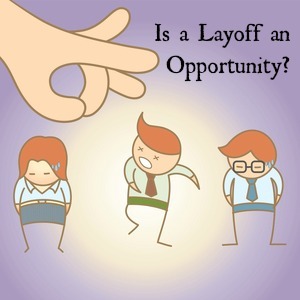 That’s one of the possibilities that could come from a layoff – if you allow it to happen. And it should always be the objective in managing your layoff. Have you ever lost a job and later realized that it was one of the best things that ever happened to you? Leave a comment! Just Awesome. it’s Really Enjoyable Post. I Learned Many Knowledge From This Valuable Post. Thank you So Much for Sharing With us.